I found the black Kimono at my local Nordstrom Rack, most stores have plenty to choose from! 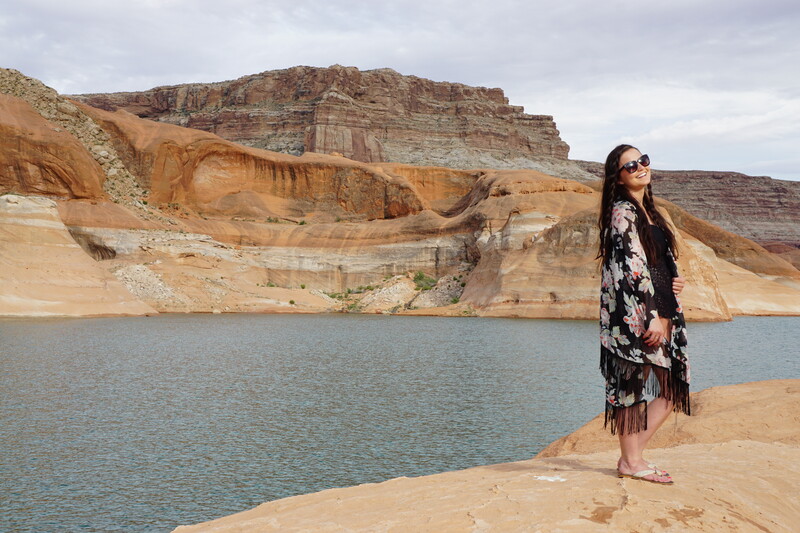 Lake Powell… I don’t know if you have ever been there but you NEED to go! 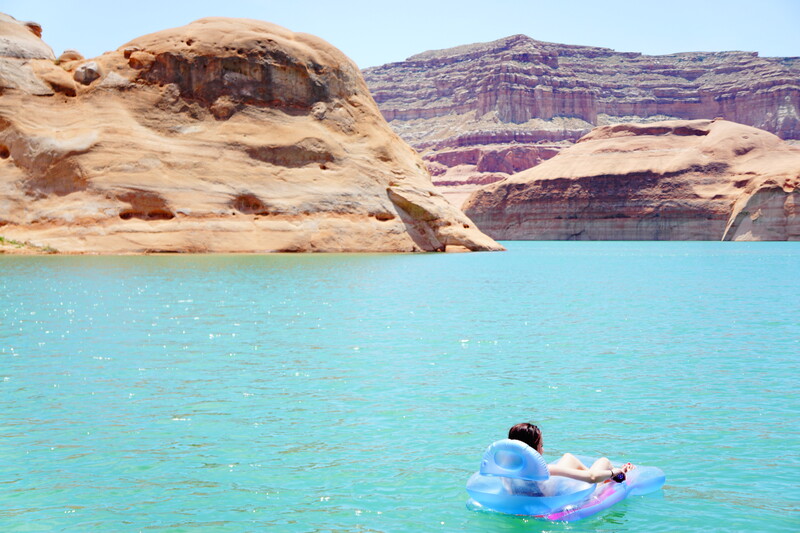 Lake Powell is a great place to go with family or friends. I went with my husband’s family and we had a blast! We flew in to Utah to meet up with Michael’s family and then we drove through all of the cute, small towns of Utah. 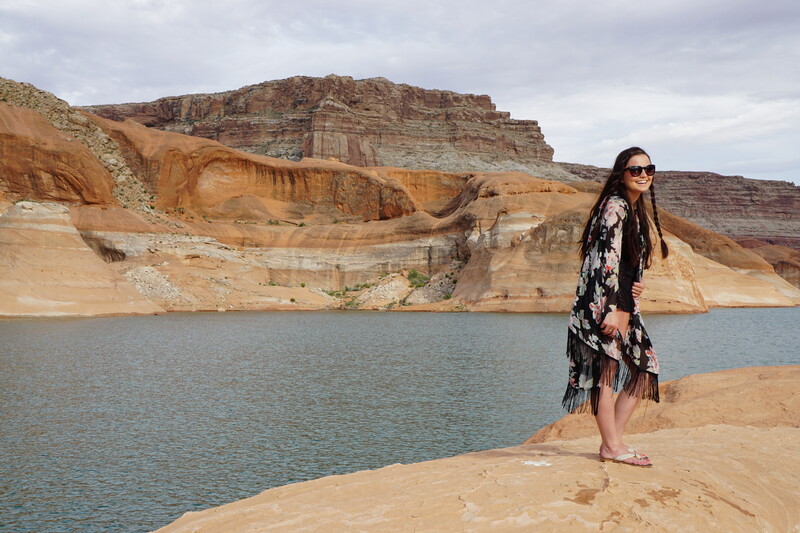 If you haven’t ever been to Powell or if you haven’t heard of it, it’s located in southern Utah/northern Arizona and the further south you go in Utah, the mountains turn to a reddish-orange color. Lake Powell itself is amazing! Picture the Grand Canyon, but full of water! Powell is an awesome place to visit because you can go out on a day trip, you can camp, or you can go out on a houseboat, which we were lucky enough to do! The Marina where our boat was docked is called Antelope Point. They have a cute restaurant on the dock that we tried out the night we arrived and then we went grocery shopping to stock up on all of the food we needed for the week; it was A LOT of food! Michael’s family has come down to Powell quite a bit, so they seemed to know what they were doing! Each couple had a day or two which we were assigned to prepare the meals and Michael’s Mom was smart enough to have the grocery list all set up ahead of time for each of the meals, which I would definitely recommend. Another option is to order your groceries online at Safeway.com and they’ll deliver the groceries to your boat! We decided we’d go in ourselves though! The next day we were able to take off from the marina and go look for “beaches” where we would anchor the boat to. Being a Florida girl, I was picturing the nice, white, sandy beaches I’m used to, but these beaches were a little different! The beaches at Lake Powell were sandy, but there were also all sorts of other things (rocks, branches, bushes) that you would have to swim around in some places. It was still fun to be able to swim and play on the beach, but it just wasn’t what I was used to! Because the water levels are always rising or falling, it’s hard to know which beaches will be under water, or a lot higher than the water mark, but we found a really cool beach this year that we had all to ourselves. We also had Wave Runners, which were great because we could go exploring through some of the canyons and we could see places that even a ski boat couldn’t get to at times. We also threw out some tubes behind them, and my sister-in-law (Matilde) and I had a lot of fun doing that. This vacation is especially awesome because the water is SUPER warm! We layed in floats and played in the water all day, every day! It did get pretty hot, so the water was so refreshing and nice. One of my favorite parts of the trip was getting to play games! It seemed to break things up and give everyone something to do other than sitting out or swimming. Our favorite games were played UNO, Pit, Q’bitz, and Dominoes. We also brought quite a few movies to watch, and it was fun to be able to end the day with a few good movies. The best part of it all though were the sunsets and the rain storms…. 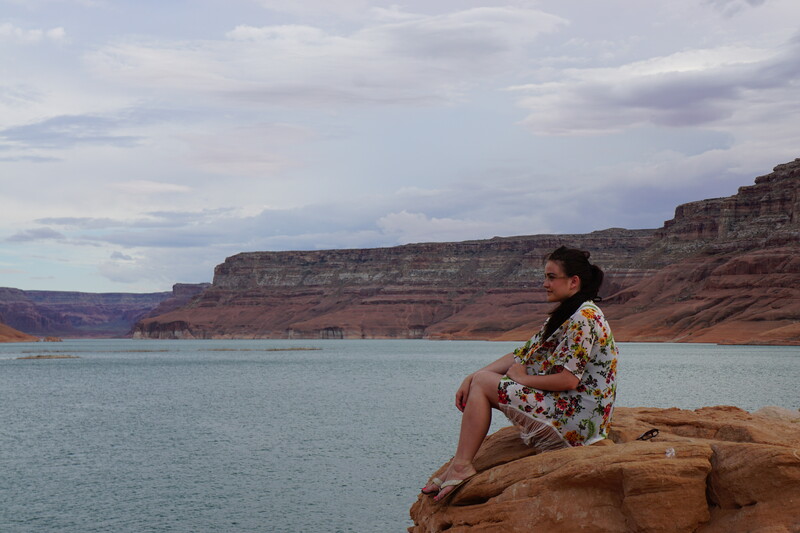 I don’t think I have ever seen anything more beautiful than a Lake Powell sunset; and the rain storms… I’ve always loved rain, but especially at Lake Powell! The rain comes in so quickly and cools everything off. It’s so pretty to see it bring out the red rocks too! While we were there, I loved wearing Kimonos…. I practically lived in them the whole week!!! I didn’t want to keep changing in and out of clothes the entire day, so I would throw on a Kimono over my bathing suit, and it was perfect little cover-up. They are super light-weight and breathable, which makes them perfect for any beach or pool day. If you like mine, I found them at Nordstrom rack for under $30. They had a great variety of colors and styles and after how often I wore them, I’m sure I’ll be back to pick up a few more!